Warlords of Draenor has some changes that you’ll want to check out. Various abilities were removed, some were restricted, and a bunch were tweeked. Healers got almost as much attention as tanks and you’re not an exception. See the changes here. This Holy Paladin guide is primarily intended for use at level 90. However, the principals will still apply during the leveling process. If you’re looking for advice on leveling your Paladin, check out our Paladin Leveling Guide. If you want the same in-game step by step leveling guide that we use to get to level 90 as fast as possible, take a look at our favorite in-game leveling guide. 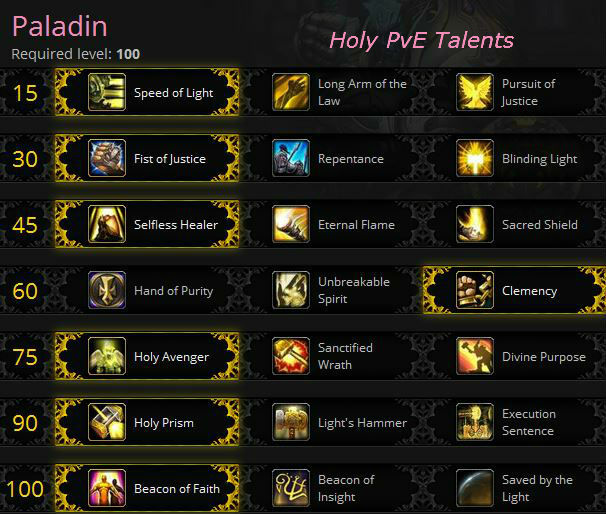 Pretty much all of the Paladin talents have some value, especially in particular situations. It also depends on what works for you. The talents picked below are for general PvE, but you may want to experiment and find out what works best for you style of game. Depending on the exact fight and the situation you might want to change talents (and glyphs) to suit. Fortunately, this is easy. Open your talent pane, click the new talent, spend one Tome of the Clear Mind, click “learn” and you’re done. Keep a stack of tomes handy at all times if you’re doing any switching. Movement modifiers. What kind of movement do you need? How much and how often? Speed of Light is a useful, burst speed increase for encounters that require it. With a 45 sec. cooldown it will be useful for fights that require the occasional dash, and not constant movement. It’s reliable, requires no resources, and is right there when you need it. Long Arm of the Law requires that you are using Judgement all the time and constantly moving (and it’s likely that you’re doing both, especially if you’re also take the Selfless Healer talent from tier 3.) If you’re not Judgmenting then take the other talent. Pursuit of Justice is a consistent speed increase that gets faster with more Holy Power stacked up. How often are you running around with three HP stacked? If it’s all the time, then this is a good pick. Crowd Control (CC:) Do you need a stun or do you need to put enemies to sleep? Pick whichever suits the encounter best as none of them impact your healing. None of these will have an effect on the bosses. Fist of Justice is an improved version of Hammer of Justice, a single target CC. Instant. Stuns are always nice, but do you need one? If you’re in the middle of the action then it’s a solid choice. No resource cost is nice, and stunned opponents take no actions. Repentance is a single target CC that lasts longer than Fist of Justice, which is why it’s picked, and it has a shorter cooldown. It breaks on damage, but can grab and sleep an add or other target for awhile. Has a cast time. Blinding Light stuns everything in a 10 yard radius, which might well have occasional use. Eternal Flame replaces your Word of Glory and is a viable option in most cases. It basically adds a Heal over Time effect to your WoG. Whether you use this or Sacred Shield depends on how you like to play Holy. It also triggers your Mastery. Hand of Purity is highly useful on encounters where you expect to be handling harmful periodic effects, and worthless for nearly everything else. If the Boss or mechanics are costing hard hitting DOTs, then this is the pick for that encounter. Lasts 6 seconds with a nice 30 second cooldown. Unbreakable Spirit reduces the cooldown on Divine Shield, Divine Protection, and Lay on Hands by 50%. If you need the protection of those spells (and you might), more than the flexibility of Clemency, then this is your pick. Clemency is the best option for most encounters, allowing you to use your hand spells twice in quick succession or more strategically to give your tank (or someone else) a pretty fair amount of extra protection. Wowhead has an interesting comment on this talent, which will give you some good ideas on its use. So how do you like your healing buffs? Holy Avenger is the 2nd recommended choice as it’s an incredibly strong burst healing cooldown, which now gives you two with your Avenging Wrath. If a powerful burst cooldown fits your healing style then this is your pick. That’s it’s a second cooldown is why it’s the pick here as it gives you more flexibility. Sanctified Wrath makes the already useful Avenging Wrath last longer, and be even more useful. You may find yourself overhealing with this talent active, with its reduced Holy Shock cooldown and increased Holy shock crit chance. Divine Purpose is a random proc and the other two provide guaranteed effects. You will get procs when you don’t need them and you’ll not get them when you do. Sometimes. Divine Purpose will provide plenty of procs over the course of a fight, and will likely provide more overall healing than Holy Avenger. If that fits your style then this is your pic. The big heals. Which one is “best” really depends on the encounter and how your group is stacked. Holy Prism is my 2nd favorite choice from this tie. It’s an area heal/damage and can be targeted on allies or enemies. It’s more versatile than the others. Cast on the main enemy or the tank or even yourself, depending on the situation. Light’s Hammer is useful for situations in which you expect your raid to stack up often. It’s provides an area Heal Over Time effect. Not so useful if the raid is spread out. Execution Sentence is solely for single target healing and it’s the best for that. Beacon of Faith: Beacon of Light can now be placed on two targets, giving you significantly more healing. Saved by the Light: When your Beacon of Light target drops below 30% you instantly grant them a shield equal to 30% of their health for 10 seconds. You cannot shield the same target twice within one minute. Glyphs are easily changed, many are useful (at least situationally) and none are “required.” Pick the set that best suits what you’re doing and your current gear level. Glyph of Merciful Wrath – 90 second cooldown (from 3 min) for Avenging Wrath, but a lesser effect. That still might be enough to let you keep everyone topped off, esp. if you’re using the Sanctified Wrath talent. If you’re overhealing with SW active then take this glyph. Glyph of Divine Protection – Taking a lot of physical damage? Glyph of DP reduces the magical damage reduction of your Divine Protection to 20% but adds 20% physical damage reduction. Glyph of Protector of the Innocent – Your Word of Glory also heals you for 20% of the amount healed, if you cast it on another person. Glyph of Beacon of Light – Removes the global cooldown for this spell. Might have some use if you want to cast something immediately after B of L.
Glyph of Divine Shield: Removing harmful effects with Divine Shield heals the Paladin for each effect removed. This heal cannot exceed a percentage of the Paladin’s maximum health. Glyph of Hand of Sacrifice: Hand of Sacrifice no longer transfers damage taken by the target to the Paladin. I assume this means that the Hand now puts a shield on the target, making things somewhat safer for the Paladin. Glyph of Light of Dawn – do you need your L of D to heal 25% more, but don’t need it to hit so many targets (max of 4 instead of 6?) Then grab this glyph. Glyph of the Falling Avenger – Take less falling damage while Avenging Wrath is active. Very situational, but could be nice. Glyph of Contemplation – Allows you to more effectively ponder the nature of the Light. In Warlords: Hit and Expertise are dead. You have an “Attuned” stat, Crit (from your level 90 Sanctified Light) which adds 5% Crit from all sources. With your base of 5% and this attuned 5% you have a 10% base crit chance. Spirit? How’s your mana? Get enough Spirit so that you can also cast that important heal. Intellect is your best stat for healing power, it improves everything that you will be doing. Crit randomly gives you those nice big heals. It’s your “attuned stat” and every crit you get is one less additional heal that you need to cast. Haste: Speeds up those cast times and Heal Over Time ticks and lowers the Global Cooldown time. You will heal more and faster and burn mana just that much faster. It will let you react faster and get emergency heals off sooner. Mastery puts a small absorb shield on your target, which is damage that you don’t have to heal. For this reason some people say that it’s actually more important than Haste. Multistrike gives a chance for one or two additional heals, based of whatever you just cast, at 30% effect. That will add a few percentage point to your total heals. Versatility is a straight up add to healing (and damage) done as well as a reduction in damage that you take. Spirit is very important, especially as you go from normal 5 mans to hard-mode 25s. Keep stacking Spirit, at the expense of everything else, until you’re happy with your mana use, or can at least “get by.” If you’re finishing the fight at full mana then you can drop some Spirit. If you’re running out then get more. In short: get enough so that you don’t have to worry about mana. Reforging: Stack Spirit and Reforge to Spirit until you’re happy with your mana usage, then go for Haste or Mastery. Seal of Insight should always be active, as it provides a bonus to our healing. Healing is more of a reactive play style than most and rather than utilize a rotation it’s simply important to understand which spells are best to use in certain situations depending on the damage being sustained by the raid. Beacon of Light should always be active on a target, usually a tank as this way you can provide constant healing to the tank while simultaneously healing the rest of the raid. The amount transferred to the target of your Beacon of Light varies depending on the healing spell used. 15% of Holy Radiance, Light of Dawn, Light’s Hammer and Holy Prism is transferred. 50% of every other healing spell will be transferred to the target. Holy Shock allows us to build charges of Holy Power for use with Word of Glory and, on a critical strike/heal, grants us the Infusion of Light proc. Holy Shock should be used as often as possible to maximize Holy Power generation. Holy Light is our default heal as it provides good healing at a low mana cost. Word of Glory costs everywhere from 1-3 charges of Holy Power, increasing in effectiveness with each charge. A maximum of 5 Holy Power can be stored at any one time, allowing us to pool Holy Power for crucial moments where a quick succession of heals may be necessary. Light of Dawn is another Holy Power Heal that is most effective when the raid is stacked up so they can all benefit from the effect. Holy Radiance is a good AoE raid healing ability and procs Daybreak which will make your next Holy Shock heal a group of targets for yet more AoE healing. Divine Light is a heavy single target heal that should be used when healing through heavy sustained damage. Flash of Light is an emergency heal with a very high mana cost for when a target is taking heavy damage and you lack the time necessary to cast Divine Light. Divine Shield, while technically a personal defensive cooldown, can be used to allow you to stand still and freely cast healing spells for the duration of the shield without fear of dying. Avenging Wrath boosts our healing by 20% for 20 seconds on a 3 minute cooldown, a useful healing boost. Hand of Sacrifice transfers 30% of the damage taken by the target to you for 12 seconds or until the damage transferred equals 100% of the Paladin’s maximum health. This ability has a 2 minute cooldown (reduced by 30 seconds with your perk.) You probably really want to glyph this as you’ll take a lot less damage. Hand of Protection bubbles the target so they take no damage for ten seconds. This will cause the mobs/boss to crops aggro from that target, so iIt’s not recommended that you cast this on the tank unless tank #2 tells you to do so. Lay on Hands instantly restores the target to maximum health on a 10 minute cooldown (5 min if you took Unbreakable Spirit.) This should be saved for a time when it’s absolutely necessary, such as on a tank. It’s doubtful you’ll get a chance to use it twice during a single encounter. Devotion Aura lasts for 6 seconds on a 3 min cooldown. It reduced magic damage taken by 20% and should be coordinated with your raid so as not to overlap similar effects. Selfless Healer should be built up to 3 stacks and saved for when an emergency heal is necessary. Eternal Flame simply augments our regular Word of Glory use and the DoT effect should be maintained on your primary target of healing, almost certainly the main tank. Sacred Shield should be used on cooldown. Hand of Purity should be used when dealing with particularly damaging DoT effects. Unbreakable Spirit is a passive ability. Clemency simply allows us to use any of our Hand spells twice in a row. Holy Avenger will allow you to, for the duration of the ability, generate nearly endless amounts of Holy Power for use with Light of Dawn and Word of Glory. Sanctified Wrath extends the duration of Avenging Wrath and reduces the cooldown (and increases the effect) on Holy Shock. See the Warlords notes just below. As you probably know gems can be really expensive and I know not everyone has tons of extra gold lying around. So if you are like me and don’t have the extra gold to buy all the awesome gems I really recommend this gold guide. It’s working really well for me so far. Gemming for gear under item level 600. Meta: Burning Primal Diamond or the Courageous Primal Diamond, if you can get that. Spirit gems if you need the mana. Your Plate bonus adds to any Int gem bonuses, making them worth 5% more Int, that bonus does not add to other stats. Gems sockets are actually few and far between, but do have a chance to appear on some gear. All gem sockets arer prismatic, there are no socket colors. In addition, there are no socket bonuses. The gem themselves are actually available. They are all prismatic, meaning they fit into any socket. None have Int, they all have secondary stats (Mastery, etc.) Apparently there are no Meta sockets or gems. Cogwheel Sparkling Tinker’s Gear: 38 Spirit – requires an engie helm, such as this. The enchants are pretty straightoforward, Int wherever possible, but there are a couple of Spirit ‘chants if you need more. As with gems, your Plate bonus adds to any Int bonuses from enchants. Note that the “breath of…” enchants are vastly cheaper than the “gift of” enchants. At least as of this writing. Enchant for Crit until it’s “high enough,” then Haste. Note that there is a weapon enchant for Spirit. Enchant Weapon – Mark of Shadowmoon – Sometimes increases Spirit by 500 for 6 seconds. Enchant Weapon – Jade Spirit: Sometimes increases Int by 83, might increase Spirit by 750 if mana is low. Enchants for item levels below 600. All racials with Hit or Expertise are gone. All races have something to offer for healing throughput. Stoneform washes bleeds and other effects and reduces damage by 10%. Mace Expertise will add 1% to your Spell Hit if you equip one. Every Man for Himself is a PvP “trinket” and it will have the occasional use in PvE. Their increased Spirit is useful, though not large. It will add to your Spell Hit via your Holy Insight ability. Increased Versatility is a useful ability. the War Stomp stuns nearby enemies and might have use when your personal space is being infringed upon. Esp. useful for PvP. The increased health won’t be of much use since you’re not in PvP, but there are those times when it’s handy. It amounts to many Stam gems. Good with Herbalism, which is a useful skill. Gift of the Naru isn’t worth much with your healing abilities. Increased Int is a nice thing for a Healer. Arcane Torrent silences all enemies within 8 yards and returns a small amount of your mana, which has some use. Blood Elves are also good with Enchanting. +1 Crit rating isn’t bad, especially when it’s already your attuned stat. All profession bonuses, such as the extra gem sockets from Blacksmithing, are now gone. Use the professions for Gold or gear. Alchemy – You can make lots of potions to boost various stats and restore mana. Blacksmithing – You can make keys for opening locks and can make gear that might be interesting to use for Transmogrification. Enchanting – in addition to all the other interesting enchants, you can do everyone’s rings and neck items. Engineering – Lots of useful gadgets and you can make that Hog so you can travel in style. Warlords has some very useful items, such as rockets, shields, a glider, etc. Inscription – One of the easiest professions to level, and about the cheapest. Everyone needs glyphs, so it can be a solid money maker. Jewelcrafting – Make nice rings and neck items, as well as gems. Leatherworking – Nothing to see here, move along. Tailoring – Nothing to see here, move along. Herbalism – for the gold. Mining – for the gold. Skinning – for the gold. How to Heal as Holy, what to use, and why, for raiding. While this was originally a 5.1 video everything in it is applicable to 5.3. Holy Paladin Gameplay – also discusses his mistakes and how to manage your mana. Need to hit the level cap quickly? Want to get another alt leveled? Need to get all your characters to the max level so they’re ready for the next expansion? Then what you need is to have an expert looking over your shoulder, telling you the most efficient path to take, where to go, and what to do. Zygor’s Guide is that expert. 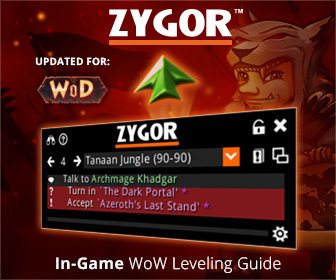 Zygor’s in an in-game widget that keeps track of everything and shows you the best order in which to do all of those quests. With the ginormous number of mobs and quests in WoW having a leveling guide to show you the way will save lots of time as you blast to the level cap. Heck, you might find yourself never looking at your quest log again. Whether you’re new to WoW or are decked head to toe in heirlooms, Zygor will keep you pointed in the right direction. Even if you gain a bunch of levels in the dungeons or PvP Zygor will figure out where you are now and where you need to go next. You’ll even be able to safely dump all the old quests. Pretty Sweet. Fully updated for all the latest patches and expansions, Zygor’s will get you where you want to go as quickly as possible. Grab your copy here or read our Zygor review first. Really helped me coming back from WotLK. I am a bit puzzled between Holu Light and Divine Light though. May you update it? It was a rocky winter. Updates coming soon.